I will be the first one to admit I do not use my phone gadgets to their full potential, despite coaching from teen son (he can only do so much.). I have not yet mastered “ring-tones”. True story: Some time after getting my most recent phone, teenager and I were driving along, talking, when I heard music. Not giving any thought to its source, I chirped “Oh, I love this song!” He hung his head. “Mom… Diane is calling, I programmed all your friends with their own songs….”. And we wonder why our children avoid being seen with us in public. Martha Stewart App: Point at house and click as if taking a photo. The app will tell you the precise position to place Ginormous Wreath. You know, the one slightly larger than the neighbors. App App: Plug in number of guests, length of party, amount of alcohol being served and the ideal number of Appetizers needed for a perfect evening will be calculated. 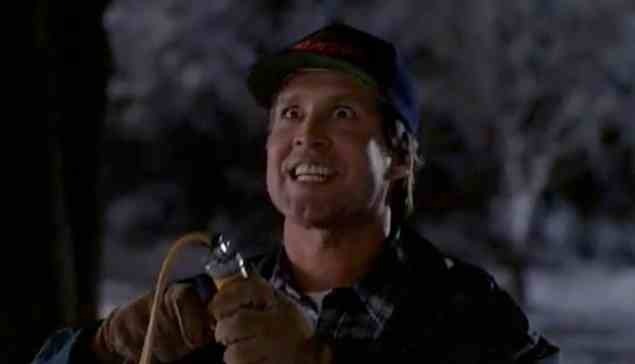 Bzzzz App: When your power grid becomes dangerously close to being overloaded, you will receive this picture of Clark Griswold/Christmas Vacation. USPS App: This will track your packages and let you know their progression and delivery. I know, this already exists. But this one would actually work. Grinch App: Tapping into Google Earth, this will tell you what outdoor decorations your neighbors have laid out in their garages, just waiting to be unleashed. You will be better prepared to purchase and strategically place window coverings as needed. HoHoHo App: Feed in details such as “seventh floor apartment” or “two story townhouse”. App returns best way to explain Santa’s arrival for those with children concerned about a lack of fireplace. KrisKringleKop App: A basic alarm system; I think it’s self explanatory. Can be used for hidden presents or stockpiled cookies. “Not to be Out-Done by Rockefeller Center”App: Enter type of tree and height, and allow this app to calculate the number of light strings your tree will take before it becomes a fire hazard. Wrap App: Scan in photos of gifts needed to be wrapped and it will calculate the square footage of wrapping paper and ribbon needed. Such an obvious one, how did I miss that! You are a genious. Diabolical in your geniousness. You made my day, “diabolical” is quite a compliment! (& I guess, so is “genius”). You need Zombie Farm STAT. It will change all your former opinions that zombies don’t enjoy a good butterfly chase across a field of turnips. ….in case you need suggestions for cat names! Enjoy your cat-time; I often look back at my 20 year old self in my efficiency apartment & wonder why I ever left that peaceful little bubble! I’m concerned though; it didnt take long for me to become addicted to the blogging thing…not sure I can handle another addiction!